Malipiero studied in Bologna and polished his skills at the Hochschule Berlin. His years in Paris brought him into contact with Alfredo Casella and Maurice Ravel. He used to be known to collectors for his Violin Concerto as recorded by Gertler (with the Casella) on Supraphon; Henri Merckel courts more danger in this piece. That was a long time ago. Now we have his symphonies on Naxos (vol. 1, vol. 2 not reviewed here - anyone care to fill the gap? - vol. 3, vol. 4, vol. 5). 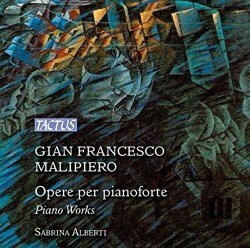 Other Naxos volumes include Tre commedie; Three Inventions, Sinfonia degli eroi, Impressioni dal vero and Fantasie di ogni giorno. Bizzarrie luminose dell’alba del meriggio della notte (1908) is a lively trilling piece at one moment, impressionistically gentle at the next, and at times striking a heroic stance. Its second movement - Il Sole - rumbles and ripples with smooth power. The final I Fantasmi trips the light fantastic, shifting mood like a chameleon on a display trip. Parts of it reminded me of Bantock's contemporary overture Pierrot of the Minute. The two Impressioni comprise a gentle Madrigale and a reverential and reserved Una processione a mezzanotte. Further understated processional material surfaces in Armenia, Canti armeni tradotti sinfonicamente although at its peak bells of joy ring out. The four-part suite La Siesta (1920) shows a change in style. Here Malipiero is more assertive and impressionistic although he cannot resist the tidal pull of the gentle chiming bell-towers of his youth. After a playful Presto Malipero returns to pensive strolling in Abbastanza lento. Tarlo from two years later is again in four pieces. These include a most satisfyingly bass-humming Alquanto lento. There's also an Allegro and a final Gaio each of which would go well on a pianola roll. The fourteen little pieces of Hortus Conclusus are from 1946. They speak of a gentle and noble spirit who remained in happy thrall to melody and trilling impressionism. The Variazione sulla Pantomima dell’Amor Brujo di M. De Falla might well have been influenced by Godowsky; it has that sort of title but its sound and demeanour also fits the parallel. It's a display piece and of all the tracks on offer here coasts close to conventional. Nothing in this recital is bland but everything is gently accessible. The booklet text is in Italian with English translation. The author is the pianist Sabrina Alberti who as player and writer is an inspired and inspiring advocate for this music.